I caught a screening of John Carter the other night, and despite some hookey dialogue I really enjoyed it. It’s the type of action/adventure movie that just isn’t done these days, and I hope the film does a lot better than last summer’s Conan the Barbarian — another pulpy action/adventure movie that was unfortunately ignored by audiences. 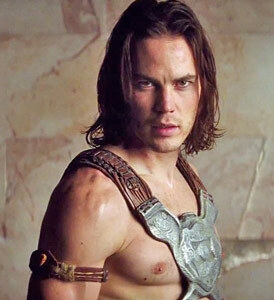 But no matter how John Carter does at the box office, Taylor Kitsch, who stars as the titular hero, has definitely made a name for himself and sure seems like he had a lot of fun shooting the movie. In particular, he opens up about the most enjoyable aspects of the production and what it was like acting a movie that involved so many digital effects. The special effects in the movie are fantastic — some of the best since Lord of the Rings — so Pixar Kitsch isn’t kidding when he heaps so much praise on Pixar vet Stanton! John Carter opens in theaters everywhere on March 9.